I bought a guitar about 6 months ago from a guy in Chicago, getting it shipped all the way to Australia. 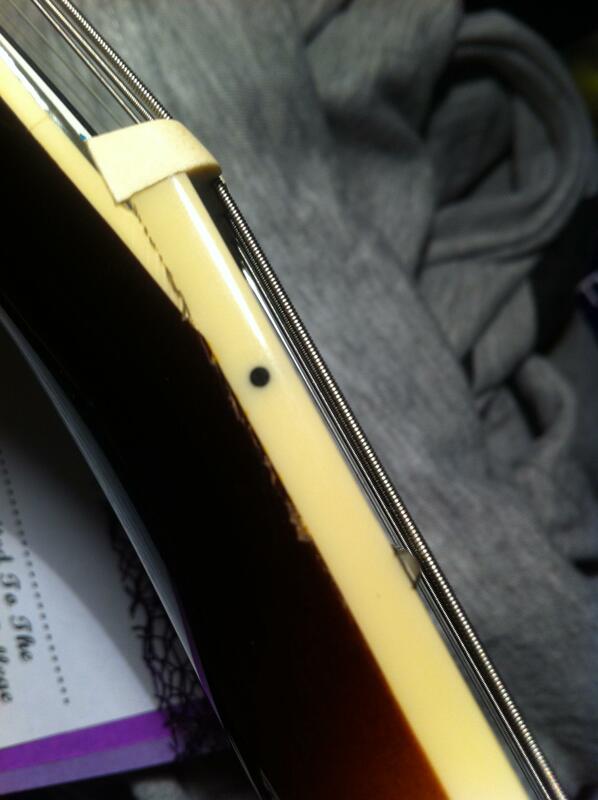 When it arrived (Epiphone Sheraton II) i noticed that there was somewhat of a crack on the neck where the fret-board meets the head-stock. It looks like the previous owner has changed the nut which I suspect may have caused the crack/split/peel. I haven't actively noticed any progression of the peeling/cracking/splitting. So what I want to ask is, do you think I should get it looked at by a Luther? Is there anything i can do myself? Or is it harmless and I should leave it be? I appreciate any input on the matter. PS. I also hang my guitar on my wall when im not playing it during the day and put it bad in its case during the evenning, should I stop hanging it from the wall? It is quite bottom heavy, so I imagine that it could put some unwanted tension on the neck that could potentially contribute to the current problem. I think you're right in saying the previous owner has changed the nut, I don't know that model of guitar personally, but to me that really doesn't look right, or like it even fits. I'd definitely have a Luther take a look at it, because that does look like a crack in the wood and not just the binding or paint. It doesn't hurt to be a little over cautious sometimes and like Tim said, it's best not to hang it from the wall until you know for certain. Try and use a regular guitar stand if you've got one. It appears from the photo that you have a slight crack in or near the joint where the headstock meets the neck. This is typically the weakest part of a guitar neck. Many guitars have a separate piece of wood from which the headstock is carved and it is joined to the neck with a glue joint. But it is also where the neck get's thinnest to allow for the angle of the headstock. It is common for guitar headstocks to break during flights on an airplane. It used to be thought (and some still believe) that changes in the atmospheric pressure/air temperature during flight (combined with string tension) was a contributing factor to this but the truth is that most damage occurs due to rough handling by the baggage handlers. It is recommended that when you ship a guitar, that you support the headstock inside the shipping box or case by stuffing packing material around it, filling all the voids, so it is stabilized. A sudden jolt to a guitar neck due to something like tossing the case into a luggage hold - could easily crack or snap an unsupported headstock. If you have not already done so, you might want to seek some relief for the damage if it occurred during shipping, or from the original seller if he/she failed to disclose the damage. If applying pressure to the cracked headstock causes it to open slightly (get a little larger) it can be repaired by injecting the right type of glue into the crack with a hypodermic needle and then clamping it. Or for a larger crack, you can push the glue in with a stiff piece of paper or plastic film. There are tons of videos like this one How to repair a cracked headstock on YouTube which show different ways of repairing cracked headstocks and guitar necks. But unless you are very handy with tools, you might want to have an experienced guitar repair technician or luthier make the repair for you. If the crack does not seem to move or open up when you flex the headstock, it might be fine to just play the guitar and hope for the best. Maybe you use this guitar for a drop or flat tuning to put a tad less string tension on the neck and it might help prevent the crack from getting worse. If you do notice it starting to get worse, it is probably best to get it repaired before it breaks completely off. Although even if it breaks completely off the neck, it can still be repaired. And the good news is, with the right glue, the repair is likely to be stronger than the original wood. It looks like the instrument took a hit to the headstock at some point. If you can't flex it or hear it rattling and it isn't changing, it probably isn't something to worry about. Alternatively, it is possible that there was some kind of acute thermal stress, perhaps during its flight to down-under. Also: the strings put more than 100lbs of force on the neck, while hanging it from a wall puts about 6lbs. I wouldn't worry about hanging it from a wall. Not the answer you're looking for? Browse other questions tagged guitar repair fretboard or ask your own question. How is string height adjusted for a neck with a compound radius ?